We are on day four of "sleep training" our 11 month old. I won't go into details but he has been a POOR sleeper. Really. You'd think a person would get better at certain things with experience (i.e. three kids) but apparently I'm not a quick learner because I actually got worse at this baby sleeping thing. The weird thing is that barring some of my bad Candida flare up days and my bout of low iron I generally am not tired during the day. Weird for me...and wonderful. I've been tired my whole life. But I do get tired during the night. Its hard waking up 4 times a night to walk to baby's room to feed him. I feel like a zombie. And I finally had enough of it last week. We were in between teeth and flu's so thought we better take action. And its working. For four nights I have only fed him once (at 2:00 am - I set my alarm). And he is starting to sleep better. But my body is CONFUSED after 11 months of frequent wake ups. Guess what time I was up this morning (for the day).........4:30 am. I could not sleep anymore. I kind of felt rested. I'm so not used to having 3 or 4 hour stretches of sleep that my body thinks its done sleeping when I get one. After tossing and turning for an hour I decided to get up at 5:30. Although it was very productive, I would have much rather been still cozy in bed. Sleeping. After 11 months of praying for sleep, I couldn't sleep. Joke's on me. Let's just hope this is not some sign of the insomnia I've kept at bay returning. So we will see if I make it through the day without crashing at some point and feeling like crap. In an attempt to keep quiet I also broke my "eat within one hour of waking up" rule for my adrenal fatigue. Could be a tough day. But the sun in shining and we are finally getting some great weather to be outside playing so it will be good either way. UPDATE (8:45 pm CST) - I didn't get tired all day. I have been going and going and going. And I'm still ready to go. Its so weird. I restarted my Candida diet and I think its working again - so I just need to follow it to a T so I don't get back off track. Yay for energy. This recipe was AMAZING. I will be making this AGAIN and AGAIN and AGAIN. The texture of the beef was just right. Although the breading process takes a few minutes and makes a bit of mess it is worth it. And its totally Candida Diet friendly. So enjoy. Have a great sunny day. In three separate shallow bowls, prepare your dreading ingredients. In the first bowl combine the garbanzo and coconut flour. Dip a piece of beef in this flour mixture (on both sides) until there is a light dusting of flour on the entire piece. In the second bowl. Beat the eggs. Dip the lightly dusted piece of beef into the egg wash so both sides are covered. In the third bowl. Mix all the breading ingredients together. Dredge the beef through the breading so it is well covered on all sides. Place on wax or parchment paper lined container. Repeat with all pieces of beef. 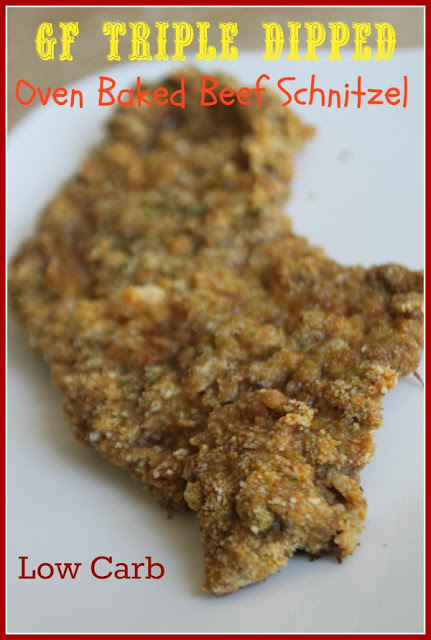 Place the breaded beef in the fridge for at least one hour to cool prior to cooking. Place beef in a single layer on a well greased (EVOO or coconut oil) glass baking dish - I used two 9 x 13 pans. Put a small pat of butter on top of each piece. Bake for 10 minutes at high heat. Reduce heat to 350 degrees and bake for another 30 minutes. My beef schnitzel assembly line. It takes a few minutes to prep with the triple dip, but it is so worth it. This breading turned out amazing. Crispy and tender and well liked by all the family. Everyone went back for seconds. Was asked to make sure we had this again. I didn't have coconut flour but tried to grind some dried coconut. It didn't turn into flour but the chunky bits in the first dredging were not a problem. I forgot to dab the schnitzels with butter, but it was still a great result without the butter. I'm glad it worked out for you even with some modifications. Its great to experiment and make do with what you have. I'm glad you liked it. I have been craving this recipe lately - think I'll make it this weekend! Thanks for the reminder of how good it is.